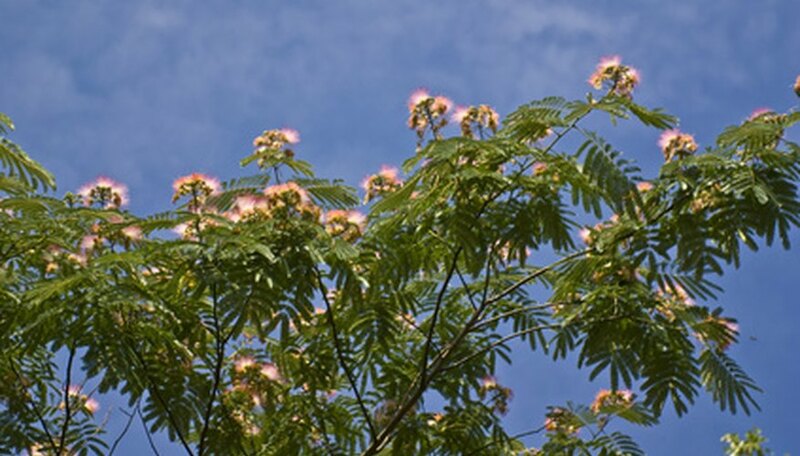 Mimosas trees (Albizia julibrissin), also called silk trees, are native to China and belong in the family Leguminosae. They are fast-growing, deciduous, medium sized trees that grow anywhere from 20 to 40 feet in height. Relatively short lived, mimosa trees live approximately 10 to 20 years. Trees produce pink pom-pom-like flowers in late spring throughout summer, followed by seeds pods. Seeds require scarification before planting for proper germination. Considered an invasive species in some areas of the eastern United States, the Florida’s Exotic Pets and Plant Council considers it a Category 2 invasive plant within that state. Harvest the mimosa seedpods only after completely drying and turning brown on the tree. This will assure the seeds are completely dry and ready for planting when picked. Break open the dried seedpod to expose the brown seeds held inside of it. For best propagation results, plant the seeds as soon as possible. Fill a container with very hot water. Place the mimosa seeds into the container of hot water and allow them to soak overnight. Fill a small container that has drain holes with a well-draining potting mix to plant your mimosa seeds. Remove the seeds from the container of water once they have swollen. The seeds will probably double in size. If the seeds are not all swollen and you desire to plant more seeds, repeat the scarification process and soak the seeds in question again. Make an indentation into the container that is two to three times deeper than the size of the swollen mimosa seed. Place a seed into the indentation and cover with soil. Lightly pat the soil down around the seeds to firm it up. Place the container in an area receiving sunlight during the day or an area receiving high light. Mimosa seeds require sunlight for the seeds to germinate. Water the container well after planting the mimosa seed, allowing water to run from the bottom. Keep the container’s soil moist but not soggy. Mimosa seeds require for germination a soil medium that is moist but not saturated. Seeds will rot if planted in continuously wet soil. Mimosa seeds will begin to sprout in anywhere from three to four days to two weeks. You can plant several mimosa seeds in the same container and thin out weak plants when you transplant the seedling to a larger container.